It is what it sounds like: a hearty meal that warms the bones while nourishing the soul. An easy make-ahead type dish you can bring with you and re-heat when needed. I love salads like this because they can be eaten for breakfast with an egg, for lunch as is, or for dinner with a protein. Did you know buckwheat is not actually a form of wheat? Neither did I until just recently. I always heard buckwheat and was turned off thinking it had gluten in it. 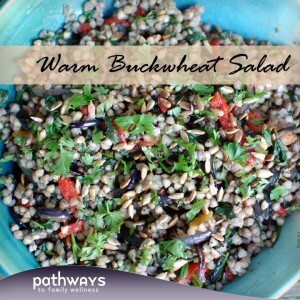 But truth is, buckwheat is actually a grain, and completely wheat-free! It has a rustic flavor with a soft pillowy feel. Can you picture it? 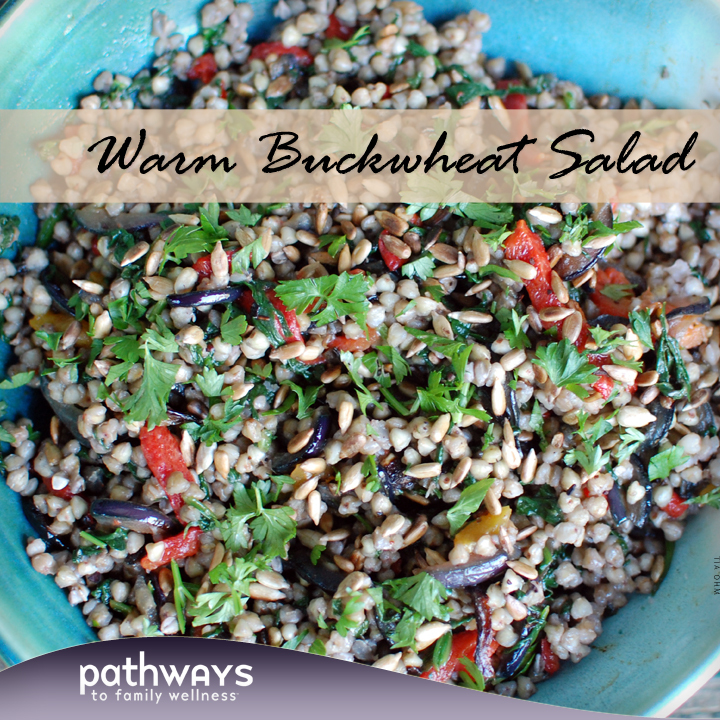 Many enjoy buckwheat as is, though it’s light and delicate flavor has me wanting to add more and more. Next time, I’d love to try adding mushrooms, more greens, maybe broccoli, who knows! Definitely a new grain in my cookbook and I’m excited to try it out. Enough talk, let’s get to it, and enjoy! Rinse buckwheat in a colander under the faucet and shake dry. Combine water and buckwheat in a pot and bring to a boil. Once boiling, cover and simmer for about 12-15 minutes or until the water is mostly absorbed. Turn heat off and let sit with lid for an additional 5-10 minutes to soak up the rest of the moisture. Fluff with a fork and keep warm. *To caramelize onions, heat a medium sized pan with 2 T butter. Add sliced onions and cook, mixing often on medium-low heat, until onions are browned slightly and very wilted; about 15 minutes. Set aside. **In the same pan, sautee spinach until wilted with a bit more butter. Add roasted red pepper to warm. Salt and pepper and set aside with onions. ***In a separate smaller pan, toast your sunflower seeds. Add seeds to a dry pan and toast on medium-low heat for about 5 minutes, constantly stirring until golden. Set aside. Combine buckwheat, sauteed vegetables, lemon juice, salt and pepper and stir well. Taste and add more salt if needed. 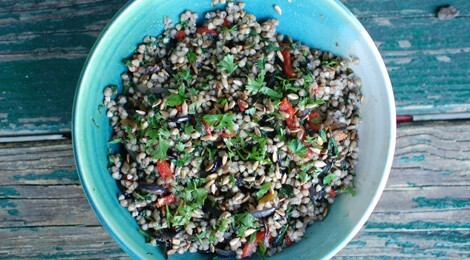 Top with toasted sesame seeds, fresh parsley and feta if desired, and serve.